Double Opt-In: What Does the Perfect Process Look Like? The single vs double opt-in debate is as famous as it is long-running within ecommerce marketing, but for those unacquainted let us briefly explain. 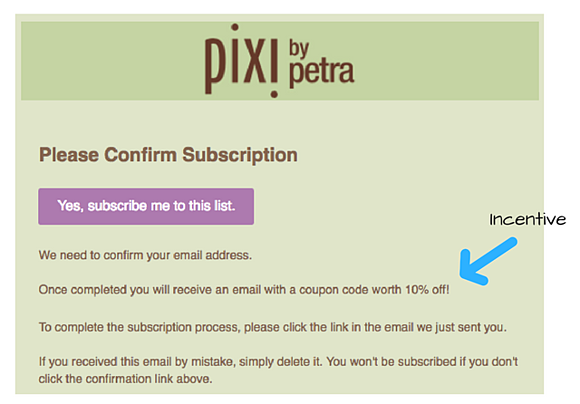 Single opt-in is where a contact is automatically added to a marketing list when they give their email address to a retailer. They are not given the opportunity to confirm that they want to be on the list. Single vs double opt in: which is best? 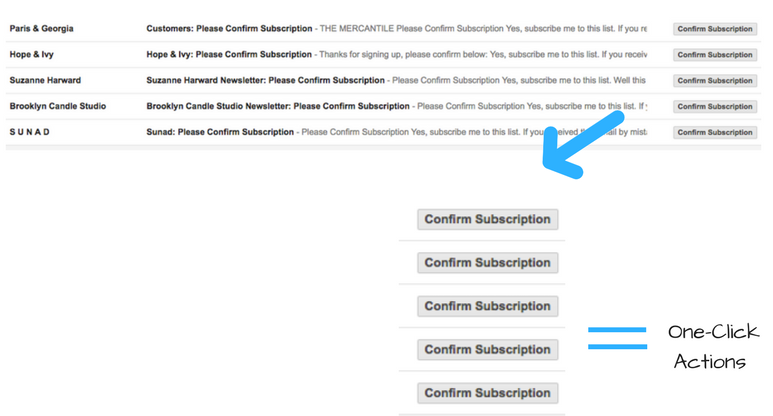 On the face of it, single opt-in seems like the obvious winner. By removing an entire step in the opt-in process, an email list is likely to grow much quicker. After all, some contacts will opt-in but then change their mind. Others might never receive the confirmation email, or—if they do—just not get round to opening it. …However, just how valuable is a big list, garnered via single opt-in? Not particularly—there’s a reason for the old adage “quality over quantity”. Whilst a double opt-in process may involve a few email drop-offs, it will ensure that those who *do* confirm are on your list for the right reasons. The health of an email list also has a direct impact on deliverability. Why? Because an email list stuffed with unresponsive, uninterested, inactive or even fake email addresses usually leads to high bounce rates, unsubscribes, fines and/or even IP blacklisting. All of which are likely to damage to your email marketing performance. By contrast, double opt-in lists are much cleaner—made up of real, relevant contacts that are opening emails and clicking through. It is this engagement which boosts a brand’s reputation as a reliable sender, and therefore improves delivery rates. The argument for double opt-in has become a lot stronger in recent years, which is in part due to GDPR. The General Data Protection Regulation (GDPR) is a new legal framework in the EU. It is designed for those with a “day-to-day responsibility for data protection”, setting out how they can protect the public’s personal data and ensure it is not misused. It will apply in the UK from 25 May 2018, and the government has already confirmed that Britain’s imminent departure from the EU will not change this. Whilst an overview of the GDPR and how it will affect ecommerce marketers is a blog post in itself (watch this space), the biggest point to make here is this: as part of the regulations, customers' consent to marketing messages needs to be freely given, i.e. it needs to be clear and in no way forced. Using a double opt-in process could be one way for retailers to ensure this is the case. So another reason to go double. As we’ve already acknowledged, double opt-in adds a whole extra step to the signup process, so the aim will be to get it as seamless and easy-to-follow as possible. Strike while the iron is hot: take advantage of the fact a contact is engaging with your brand by sending them their confirmation email as soon as they’ve submitted their email address. Optimise your subject line & “from” name. 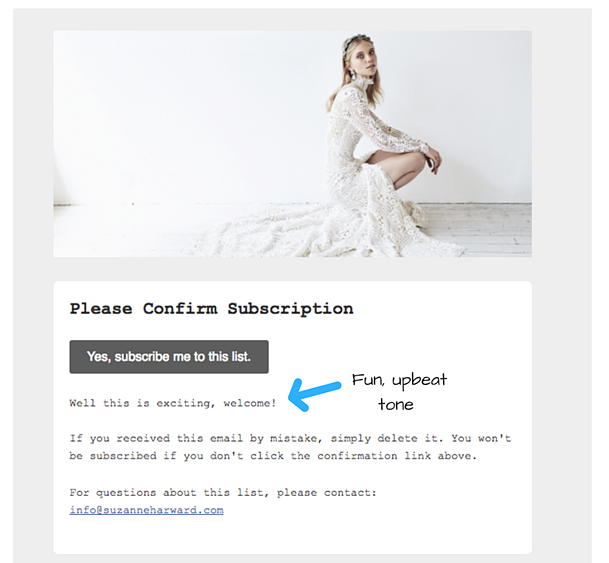 While creative copywriting is a sure-fire way of getting your newsletters noticed and opened, for functional emails like double opt-in confirmations, simple, clear subject lines are often the best. Just one word transforms the tone of this email: “Friends”. This implies contacts who confirm their subscription won’t just be signing up to marketing messages, but also a friendship. These are small tweaks, but are likely to increase the chances of your email being opened. Now for the fun part: making your confirmation email as interesting, well-designed and “you” as possible. 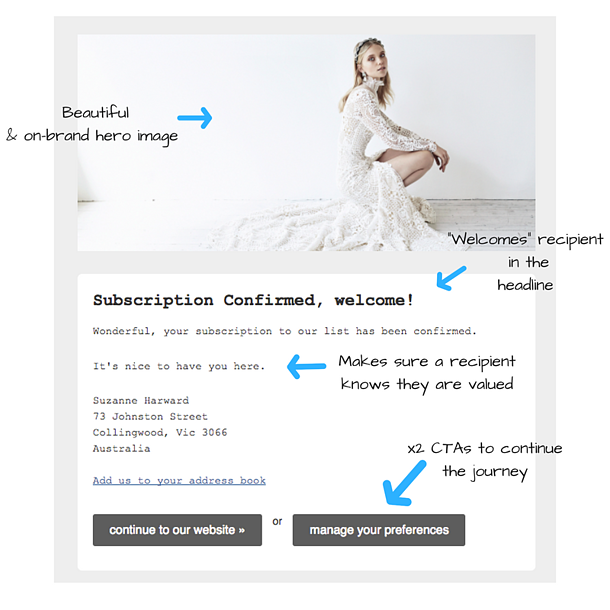 Treat your confirmation email like a branding exercise, factoring it into your welcome series and overall marketing strategy. That said, avoid going too crazy: these emails need to serve a very basic purpose, so overly busy templates are a no-no. It’s all about little details. Below are a few ideas that will hopefully show you what we mean. The last thing you want is for your confirmation email to sound automated; this isn't going to make any recipient feel welcome or excited by the prospect of signing up to your brand. Through bubbly and warm copy, Suzanne Harward makes recipients feel truly welcome, and far more likely to confirm their subscription. Vocabulary is important, but your words also need to have meaning to make an impact. In today’s competitive retail market, subscribers want something in exchange for signing up to a brand; this could be the promise of great content, access to exclusive events or a discount. 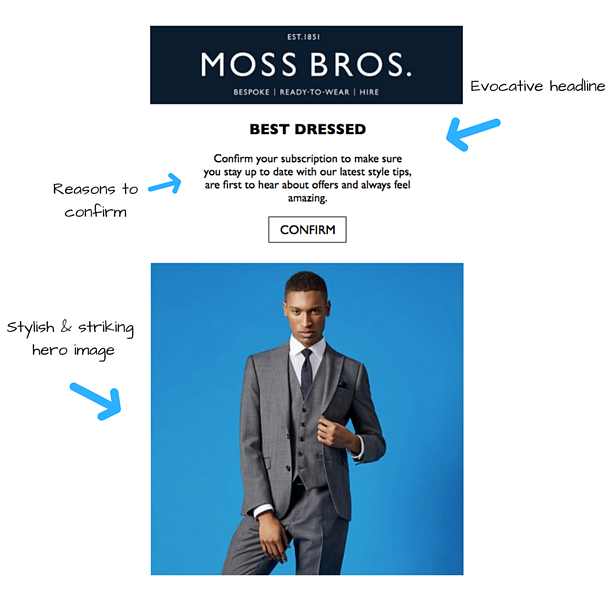 As we pointed out in our last blog post (6 Secrets to Upgrading Your Transactional Emails), transactional email templates (confirmation email included) are often generated by ecommerce platforms, and can sometimes look too “coded”. However, there are solutions (like Ometria) that give you more creative control over how your transactional emails look. 3) And for those who don’t have time to open your confirmation email? All of the above aside, there will always be some cases where recipients don’t have time to open your email when it arrives, which is why you should use Inbox Actions. Inbox Actions enable users to interact with your brand “right inside Gmail and Inbox”. 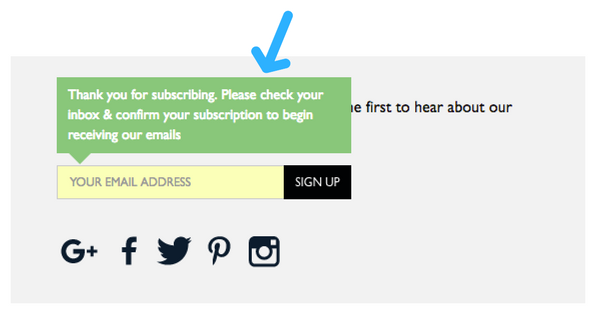 Looking specifically at One-Click Actions, recipients can confirm their subscription without even opening your email. Whist these recipients will miss out on your well-curated confirmation email, they will at least be able to engage with future correspondence. As we established in our introduction, double opt-in is the way forward. Which is why we recommend thinking about it now (if you're not already). - Ensure your confirmation email is actually opened by: preparing a recipient that an email is on its way, optimising your subject line and sender name and ensuring your IP address isn’t blacklisted. - Use copy, message and design to make your email look and sound more "you". - Reach those who don't have time to open your email by using Inbox Actions.